These days it is not a rocket science to build a website, and you don’t even need to hire a developer for its customizations. Yes, you heard it right! We will tell you some of the very free means of having your website done at very low cost or nearly free. A website builder is a great tool to use if you would like some assistance with creating a website. You can find templates and guidelines for how to structure to the site, and then all you need to take care of is the content and maintenance of the site. Who uses website builder? There is no explicit mentioning about who uses website builder as it doesn’t need high professional skills to use website builder. Photographers, start-ups, freelancers, etc. could use this. There are two types of website builder which an individual could use according to the flexibility and the work he has to do. Some of the website builders are totally free of cost to use, while others may charge for some of their services. Wix stands out as a unique type of website builder as you don’t need any professional skills to design or create your site. You will be able to create your website in just 15 minutes. There are some steps you need to follow to create your website. Firstly, you have to choose a template. From there, you can remove or add content blocks. Then comes what you want to upload in your websites, such as text, images, effects, videos and Popups. As well as, connecting to your domain and publishing your site. Finally, you present to the world your site created by you. You could download this for free and start to customize your site. There is no limit to upload things and disk space. You can change themes, fonts, scheme, color and more if you are using Wix. Which can make creating a website easier and faster and more reliable. Make use of this website builder to create your site with the designs and templates. The best part of this site builder is that it is free and you don’t have to pay anything to use their service. You could check online about this site builder and get the reviews of this. Imagine over 100 million users have built their sites using Wix, since its launch in the year 2008. It’s evident that this company is doing everything right. Good Website Templates – you may choose from a gallery of 500+ unique designs. You DON’T need any Tech Skills — Friendly drag and drop usage with maximum flexibility will do. Mobile features – Not much useful for clients looking forward to focusing on the mobile field. But Wix mobile app is very useful for website owners since it will allow you to control your site full on the go. Wix Forum – Create the online community on your site so that new visitors can interact with other users. SEO – You can get a personalized SEO plan to make your site optimized and get found on Google. Wix Chat – Using this feature you can have a live chat with your visitors and solve their problems. Wix’s Website platform is best remembered for its user-friendly design and the wide variety of interactive features, like the smooth drag and drop ability. Just after twenty minutes of exploring and experiencing Wix’s first site-building interface, it is very easy for you to figure out why Wix is one of the globe’s most used and reliable website builders. It’s quite simple to use irrespective of your experience and tech skills—and you might make any website with Wix. The Wix interface has the most user-friendly features. In literally not more than 5 min, you’ll be able to choose something great as the template for your site and begin customizing the same to your liking. 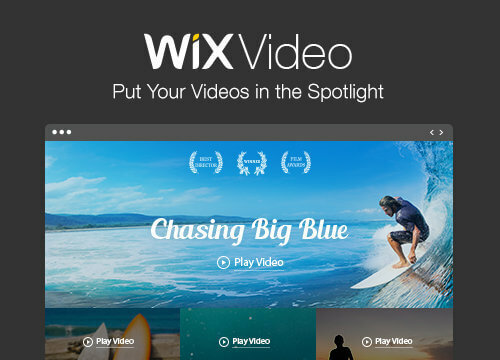 Wix Video allows you to showcase your videos on your site so that visitors can easily stream through the video player. You can create your video channels and add them to your store. If you already have videos on Youtube, Dailymotion or facebook then you can embed them to your site. You can even sell, rent or offer subscriptions to your videos which are 100% on the commission basis. Live stream your videos from youtube to your online store. You can even sync the videos to the youtube feed so that visitor doesn’t miss any new updates. The best part about the Wix video is its beautiful layout which makes users watch more videos. It is available for free and premium version. Although the sites allow hosting at literally free of charge, there are charges if you want to increase storage, or bandwidth or want access to different advanced features than you need to for the premium package. It will have all the advanced features and premium support.